Bans on phones in schools are increasingly becoming a thing of the past, new research shows. A survey from the National Center for Education Statistics exploring crime and safety at schools indicates that there is a trend toward relaxing student smartphone bans. The survey reports that the percentage of public schools that banned cell phones and other devices that can send text messages dropped from nearly 91 percent in 2009 through 2010 to nearly 66 percent in 2015 through 2016. This drop did not coincide, however, with more lenient rules around social media. In 2009 and 2010, about 93 percent of public schools limited student access to social networking sites from school computers, compared to 89 percent from 2015 through 2016. That’s likely because these bans aren’t lifted in response to student demands to use their electronics during school hours—they are bending to the pressure of parents who want to be able to reach their kids. Dr. Liz Kolb, a professor at the University of Michigan’s School of Education, cites a recent Nielsen survey, which found that parents want their children to have phones so they can easily stay in touch. The survey itself examines school crime and safety, and the Associated Press notes that phone access is crucial in the midst of a school emergency, adding that students at Marjory Stoneman Douglas High School used their phones during the school shooting in February to reach loved ones, call for help, and share updates on the rampage in realtime. The New York City Department of Education ended its cell phone ban in 2015, meaning students were no longer prohibited from bringing the devices to school. The new rules instead let school principals design their own policies around cell phones. While the ban was in place, students paid businesses near campus $1 per day to hold onto their phones during school hours rather than leaving their devices at home altogether. The phone-holding industry was reportedly making around $4 million a year. There are still schools hellbent on banning the devices. 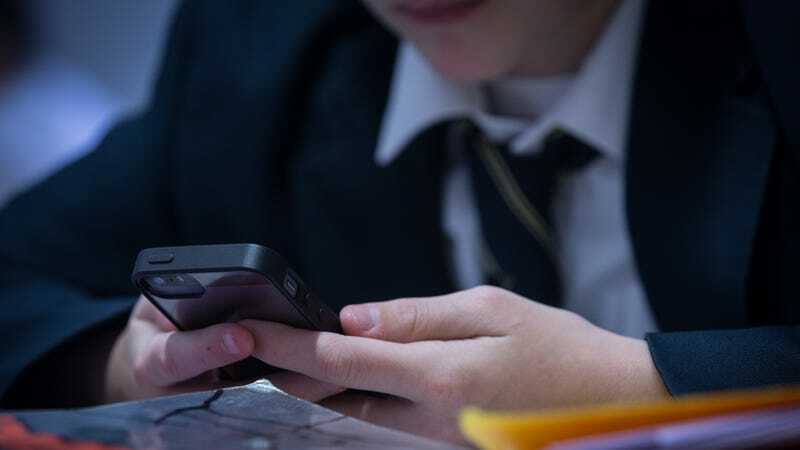 In December of last year, a high school in Connecticut banned phones after “mean spirited behavior” via texting and social media, according to the Associated Press. And a middle school in Colorado also recently banned phones during school hours. Most schools instituting total bans on smartphones argue their absence helps eliminate distractions and cyberbullying. But a steep decrease in bans across public schools indicates that, for many schools, parental pressure and a means to communicate in the event of an emergency outweigh frivolous distractions. Eliminating the ban certainly make more sense than, say, mandatory see-through backpacks. Update 11:15am: Added comment from Dr. Liz Kolb. Sprint Gives High School Students a Million Free Devices—So What&apos;s the Catch?